Thiols at the origin of life? Where did we come from? Humanity has for a long time wondered about the origin of life (OoL) and asked the subsidiary question: “are we alone in the universe?”. More recently,refined questions such as: “How can it be possible to become alive from inert matter?” or “Are there other chemical solutions than the one we know that could lead to life?” have been also asked. Many hypotheses concerning OoL, sometimes partly supported by preliminary experiments, have been proposed over the last decades. The discovery of catalytic RNAs has originated the ‘RNA world’ theory claiming that information came before metabolism. Conversely, other researchers have put forward the hypothesis that catalysts, such as genetically un-coded proteins, came first. Each side has endeavored to find chemical evidences to show that it is possible to produce either nucleotides or amino acids from a prebiotic ‘soup’. As an alternative to these two positions, it can be postulated that initially the chemistry of simple organic molecules determined the process; it generated metabolism sequences that were optimized through the replacement of catalysts, which became increasingly efficient, without affecting the reactions themselves. In line with this alternative approach, a key role has been proposed to minerals and transition metals in the acceleration of relevant chemical reactions. We aim at addressing the origin of chemical processes involving key cofactors from modern metabolism and we have decided in this thesis project, to begin this analysis by focusing on the role of thiols as represented by coenzyme A (see figure). Coenzyme A and the related pantothenic acid (vitamin B5) and ACP (acyl carrier protein), play a central role in metabolism, are ubiquitous and are involved in over one hundred reactions. Indeed, they are found as key actors in fatty acid synthesis and degradation as well as in pyruvate oxidation. They are also involved in non-ribosomal polypeptide synthesis. Thiolates are used to produce ‘activated’ acyls through thioester bond in esterifications, amidations, and anhydride and C-C bond formations. The candidate’s project will be initially centered on the reactivity of coenzyme A mimics towards simple molecules such as H2, N2, H2O, H2S, NH3, CH4, CO, CO2, HCN and P4O10, known to be exhaled from magma. He/she will also look for conditions to produce thioester bonds from more complex molecules derived from the citric acid cycle. He/she will search for activating systems such as transition metals and/or polyphosphate to produce peptide bonds. The student will develop the required detection protocols and will interpret the results taking into account the physical properties of the factors in order to determine which are contingent and which are chemically determined. From his/her work it is expected that a better understanding of biological thiol evolution will emerge. This thesis project is part of a comprehensive cross disciplinary project focused on the ‘Common Origin of Life’ (COoL) supported by the Grenoble-Alpes IDEX (ANR-15-IDEX-02) bringing together astrophysicists, chemists, biologists and humanists. The work will be cosupervised by Pr. 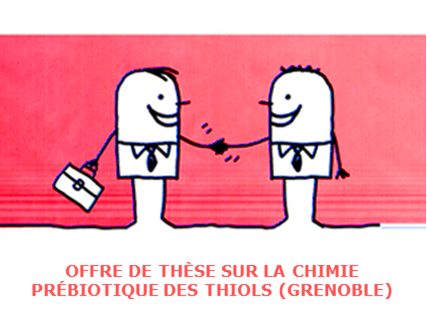 Yannick Vallée at the Département de Chimie Moléculaire, UGA (yannick.vallee@univ-grenoble-alpes.fr) and Dr. Yvain Nicolet at Institut de Biologie Structurale (yvain.nicolet@ibs.fr), both in Grenoble. Candidate profile: The candidate should have a Master2 or equivalent in organic chemistry with a strong background in inorganic chemistry and a good background in biochemistry. The project should start by October 1st 2018.